How has your week been going so far? Life has been crazy busy for me with running, working, and blogging, so if I’ve seemed a bit quiet lately, I apologize! 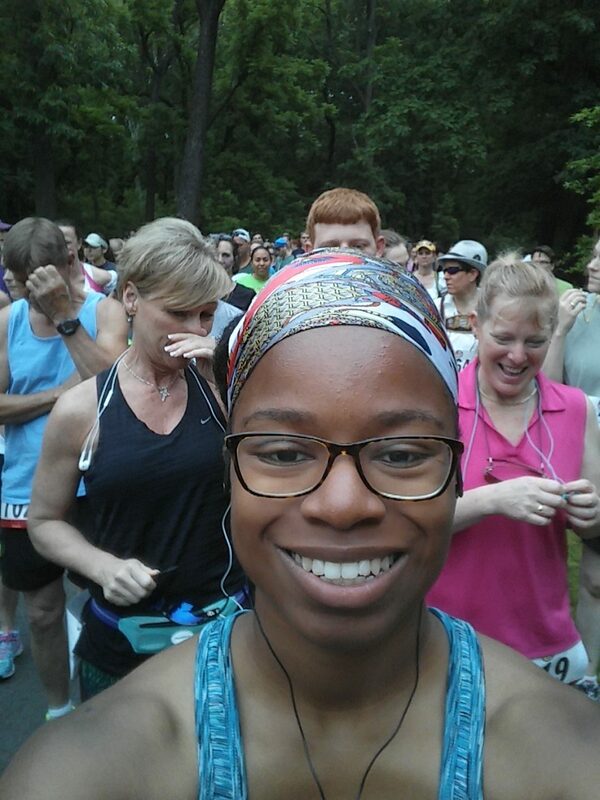 I’m so excited to finally share my recap of last Saturday’s 1/2 Sauer 1/2 Kraut Half Marathon! 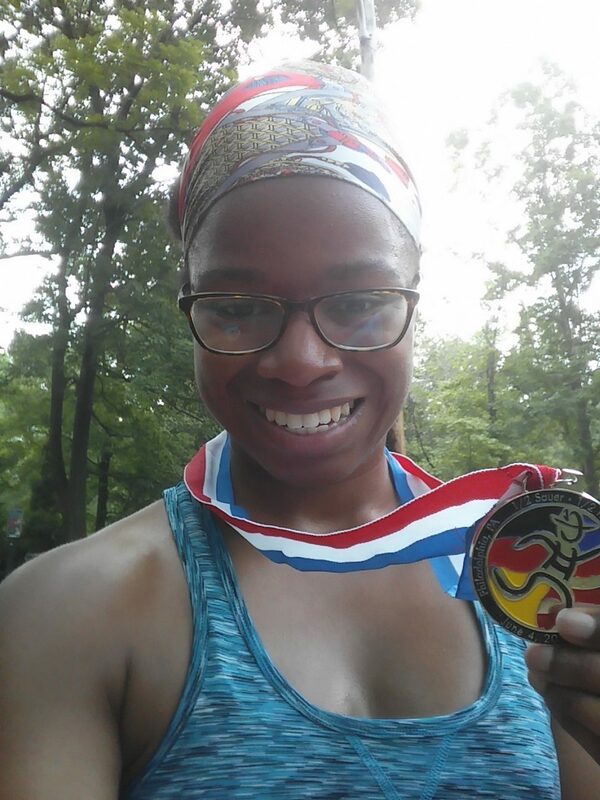 While the humidity was absolutely miserable, we had much cooler weather this year and I was happy to have a good race! I wanted to end the race with a smile on my face, and I’m happy to say it was a Mission Accomplished! I’m sharing this post with Jill Conyers for the Health, Fitness and Happiness linkup and the lovely ladies of Wild Workout Wednesday: Jen, Nicole, Annmarie, and Michelle! The 1/2 Sauer 1/2 Kraut is a hidden gem when it comes to local Philly races, and Bret and I love it so much that this year we signed up for our third and second time, respectively! The race is held the first weekend in June so there is always a high chance of having very hot weather on race day. Last year was absolutely miserable, so I was prepared for the worst. There is also a full marathon offered if you’re crazy enough to want to run the half marathon course twice! This is a really fun race and a great way to close out the spring racing season. 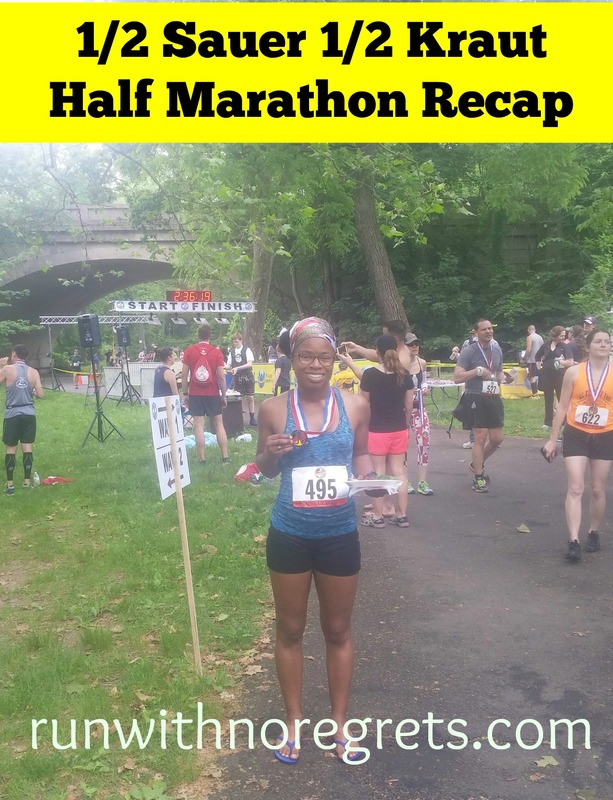 If you’ve been following along on the blog, you know that I ran a lot of races this year and picked up a couple of PR’s in April, so I really wanted to end things on a high note. The week of the race, I went on a couple of short runs but really struggled with the heat and humidity. I also had some nagging calf and shin pain on those runs so I was a little worried about having to endure that for 13 miles in addition to the heat and hills. I used Thursday and Friday as an opportunity to completely rest my legs. I wish I could say I had a healthy meal for dinner, but I had a chicken cheesesteak and some BBQ Utz chips. They hit the spot! But I wasn’t completely unhealthy; I made sure hat I hydrated all week long! I ended up going to bed around 11 or so, but not before laying out my race clothes to share on Instagram! I set the alarm for 5 am to have enough time to have my usual toast and jam before making the half hour drive to Northeast Philly with Bret. Before we could park and check in, we had to make a stop at Wawa. Bret needed to get his coffee! I have to admit that when we did park at the Canstatter a little after 6 am, I was getting the feeling of deja vu. Everything was so familiar from last year: heading to the basement to pick up our bib, admiring the cuckoo clocks that would be given to award winners, checking out the old T-shirts for sale for charity. Remember when I talked about the benefits of repeating races? This is where the familiarity is a good thing. Once we had our things settled, we got on the bus to take us to Pennypack Park, where we would wait until the race started at 7:30. After using the potty and doing a few warmups, a couple of ladies dressed in matching German attire came up to me and said hello. They found my recap of last year’s race online and recognized me! They were so friendly and I wish I got their names so if you’re reading, hello! I was so pleased to see them more than once while running on the course. The 1/2 Sauer 1/2 Kraut lines up the half marathoners and marathoners together at the starting line and separates runners by waves. Once again, Bret was in Wave 1 while I was in Wave 3. Various German songs were pumping on the loudspeaker before we were set to head off, and the announcer pumped us up to get ready to go. There was an issue with the clock, so we didn’t start exactly at 7:30 am, but they seemed to sort things out before officially starting the race. Before I knew it, my Spotify was playing, selfies were taken and I was heading off! I didn’t notice a strip on the ground to register my chip, so I had a slight delay of a few seconds before I started my watch. So there I was, back on a course that I have already run and “conquered”. The funny thing was that the first few miles weren’t nearly as recognizable to me as I anticipated! The course felt a lot hillier in those early miles! I knew I wanted to start out slow to preserve my energy for all the tough hills ahead, but I mainly ran on effort instead of pace. I couldn’t really gauge how fast I was going, but the first 4 miles went by very quickly. The humidity was ridiculous and I was drenched in sweat within the first mile, but we were lucky to have cloudy skies and a temperature around 70 degrees. I even felt a breeze at points! Thank goodness for running in a park! I did start to encounter my first big hills around mile 5, but I was ready for them. I made sure to run with proper posture as I ran up each hill and took advantage of gravity when going down. I may have looked ridiculous, but it worked! I felt much stronger climbing the hills than I did in 2015. Maybe the King of Prussia 10 miler really did help me out, as these hills were babies in comparison! While I was running there were several people around me that seemed to either be ahead of me or behind me. Were we motivating each other? It’s possible! There was a couple wearing gray that were always right ahead of me, and I used them to guide me along since they seemed to be running a consistent pace. Lots of people used walking intervals due to the hills. Once again, I was getting feelings of deja vu from last year’s race! As I got to mile 6, I knew that we’d get to the “weird” part of the course where we turn around some cones, run in grass, and head to the trail section of the course. Last year, I got hit by a bike. Seriously. Thankfully, they made some changes this year and roped off the section so oncoming trail traffic wouldn’t be able to run into us. The trail section may have been less than 2 miles but it felt like an eternity. The terrain was much more difficult to navigate this time around, and since it’s so narrow, I always felt like I was in someone’s way. There was a woman in a purple shirt that was behind me for awhile and I felt so bad because I knew she wanted to pass. Eventually she did and I kept her in my crosshairs for a while. We actually had a portion at the end of the trail where we had to run under a bridge. It was pitch dark! I was glad to get out of there! Then I had the challenge of going BACK over the hills from the first half of the race. They felt a lot tougher going in reverse. I continued to do the best I could, but I think they were starting to wear on me and my pace slowed considerably. A little around mile 10 I really felt like I was running through quicksand. At about 10.25 miles I took a walk break of about a 1/4 mile. I felt a little bad since it was so late in the game, but I had to listen to my body. The funny thing was that while I was trying to finish up the half marathon, there were runners passing by that were going for their second lap. I can’t even imagine! After my brief walk, I got back into it and tried to just take things one mile at a time. I try to take advantage of the last few miles to pick up my time and finish strong, but it wasn’t easy at all. I was so close I could taste it, but the trail back to the finish line was neverending! At this point, the view of the creek and trees were so boring! Somehow, my pace quickened to the point that I ended up catching up with and then passing the couple in gray and the woman with the purple top. I was just glad to be closer to the end. Then in the last mile, I saw my ladies in the German outfits! It really gave me a boost to see them and I pushed myself to see if I could catch up with them. As I did, one of them started to slow down, but I tried to give some encouragement since we were so close! Of course, being me, any time I see a finish line, I surge. I saw Bret at last and I knew it was time to push it. I ended up passing the ladies and bolting to the finish line. I couldn’t have been happier! According to my watch, my I ended up with 13 miles in 2:18:13, a 10:38 average pace. The 1/2 Sauer 1/2 Kraut Half Marathon was a success!! While my finishing time isn’t exact, it’s a great indication of how I was able to perform on a hilly half marathon. Honestly, I’ve been wondering if my past races were a fluke, but this shows that I’ve been really consistent. I’m also happy to report that Bret ran the race in 1:44 and some change, which is a new PR for him! Bret has been doing amazingly well on these hillier courses, so I’m going to encourage him to sign up for the Rock n Roll Half Marathon in Philly to test his speed a flat course. I really believe that Bret can run a half in the 1:30’s, he’s a really talented runner! I was so tired after crossing the finish line, but I had to go for the best post-race food right past the finish line: watermelon, Twizzlers(! ), banana bread, and duplex cookies! After noshing on the food and doing a few stretches, we headed back to the buses so we could head to the afterparty. We were entitled to a free beer and bratwurst at the Canstatter, and they were SO good! Last year, the lines for beer and food were so long, but this time, we were able to get our food quickly! I absolutely adore the 1/2 Sauer 1/2 Kraut Half Marathon. I was so glad that this year the weather was much less miserable and I was able to perform at my best effort. Once again, the race organizers and volunteers made it a great experience! Great bang for your buck. You just can’t beat the value on this race. Nice swag. The medal and T-shirt have the same design each year, but the quality is nice! Great course support. The volunteers were fantastic! We had hydration just about every 2 miles with water, Gatorade, and/or Gu. Great entertainment. 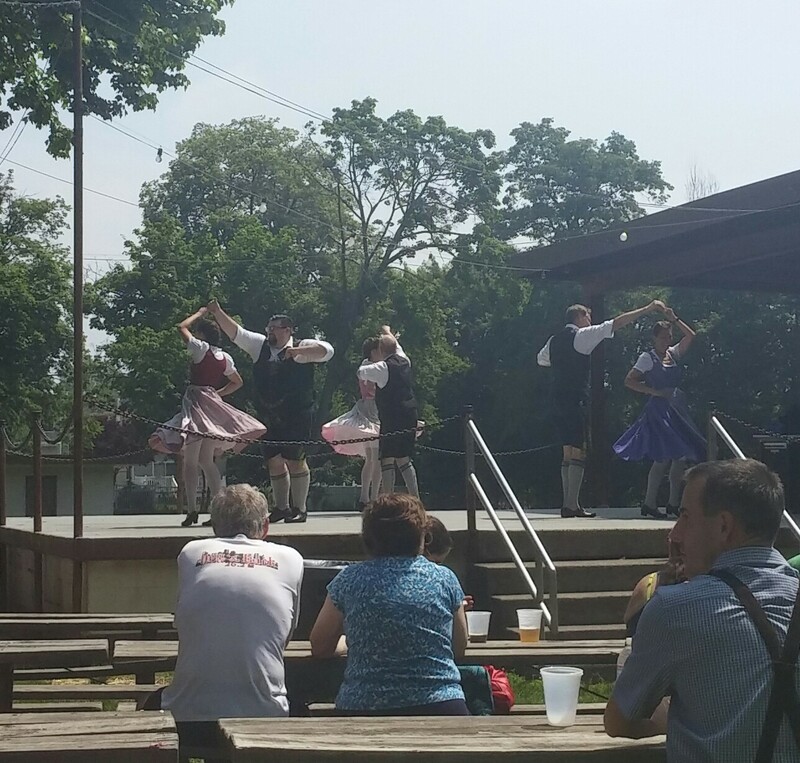 Uberhans on the accordion and some authentic German dancing…it never gets old! Not too crowded. I had points where I felt completely alone on the trail, which was a nice change! There aren’t a lot of spectators. This year, there were very few spectators along the course. I forgot to mention getting rejected for a high-five while on the course…SMH! If you need more external motivation along the course, it might be a struggle for you. Running in the grass is awkward. While it’s not a significant portion of the course, it’s still my least favorite section of the course. I think I may have lost some distance since the area isn’t well marked. Thanks to everyone who wished me luck on this race! I really appreciate your support. While I wish I could say that I’m all rested up, the madness continues as I build up my mileage for marathon training in August. It seems that “no rest for the weary” is the story of my life! What is/was your last race of spring? What are your racing plans this summer?